What is Blood Blister and Melanoma? Blood blisters are like normal blisters that are caused due to pinching of skin. 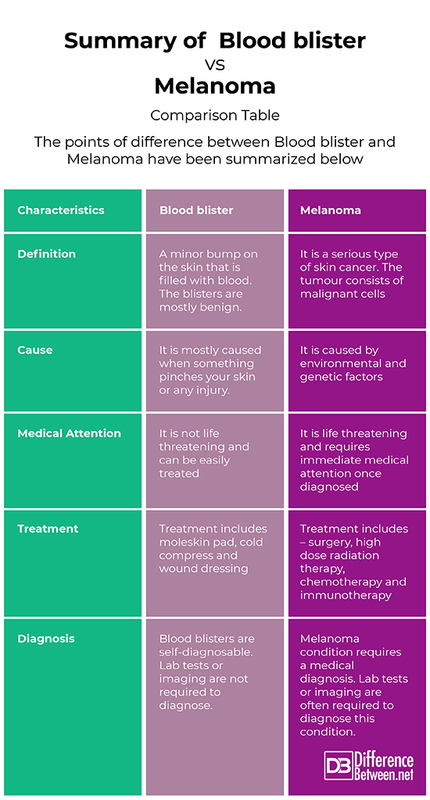 Melanoma is a serious type of cancer of skin. Initially it does look like a normal blood blister but the two are different medical conditions. Former is self-treatable and the latter needs medical attention and proper medical treatment. A blood blister occurs when the subdermal tissues are destructed without piercing the skin. So, when the skin is pinched, bruised and rubbed, a blood blister will form. 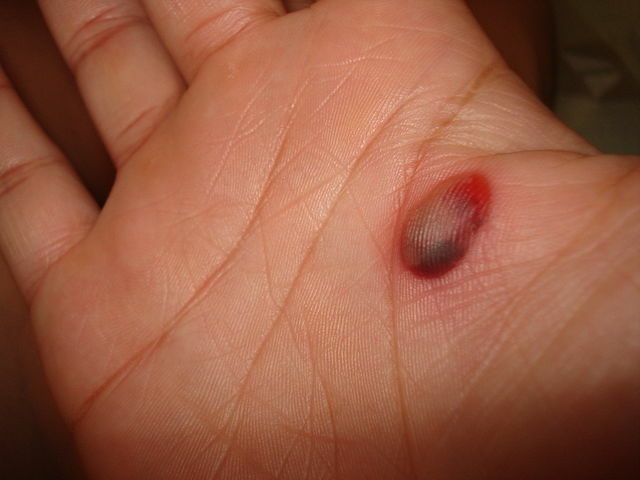 A blood blister appears like a blood-filled ball covered by skin. The presence of blood in a blister shows the presence of high pressure component. Unlike friction blisters which contain a clear fluid, blood blisters comprise of a red liquid. The fluid begins as a light red color that appears darker after some time. Most of the blood blisters cause minor discomfort and irritation. However, some blisters are extremely painful in case there is infection. It is usually self-diagnosable and heals on its own in 1-2 weeks, but needs medical attention in case there is severe infection. Applying antibiotic cream over the blister helps to heel it faster. Melanoma is the most dangerous form of skin cancer. The malign tumours grow when the unrepaired Deoxyribonucleic acid damage to the cells of the skin causes mutations. These mutations cause the damaged skin cells to multiply rapidly and develop malignant tumours. This damage to the skin is mostly caused due to UV rays form sunshine or tanning beds. Melanoma grows when the pigment-producing cells which are responsible to give colour to the skin becomes malign or cancerous. 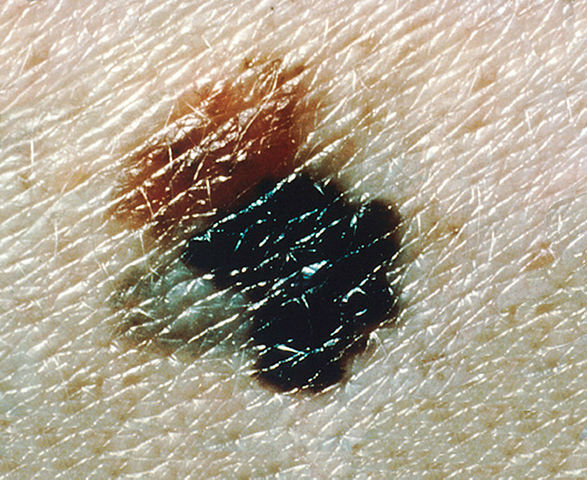 The probability of developing a melanoma increases with age. It is the most commonly registered cancer in men aged between twenty-five – forty-four and the 2nd most commonly registered cancer in women between the same age group. It is a raised, blood-filled sack on the skin. It is a serious type of skin cancer. Avoid wearing tight and uncomfortable shoes that do not fit. People with fair skin, freckling, and light hair should keep monitoring their moles, any warts or lumps as they are at greater risk of getting melanoma. People with weak immune system should take extra care. Avoid to put pressure on the blister by wearing open-toe footwear. Common medications used for melanoma include DTIC – Dome (dacarbazine), which is the only FDA-approved chemotherapy for melanoma. Methazolastone, Temodar (Temozolomide) is an oral version of DTIC, which is used for the treatment of stage four melanoma. Dr. Amita Fotedar -Dr. "Difference between Blood blister and Melanoma." DifferenceBetween.net. September 20, 2018 < http://www.differencebetween.net/science/health/difference-between-blood-blister-and-melanoma/ >. Leatherman, M. (2004). What Caused a “Blood Blister” to Develop? Advances in skin & wound care, 17(7), 341. Michailidis, L., May, K., & Wraight, P. (2013). blister management guidelines: collecting the evidence. Wound Practice & Research: Journal of the Australian Wound Management Association, 21(1), 16. Riker, A. I., Zea, N., & Trinh, T. (2010). The epidemiology, prevention, and detection of melanoma. The Ochsner Journal, 10(2), 56-65.